The rafters are calculated after selecting the layout scheme, mutually attaching the legs in the skate, and the method of joining to the power plate. This will allow the first stage to determine the direction of the efforts transmitted by the bar / board to the walls. Independent calculations are complex, require practice, knowledge of geometry, physics. For the convenience of developers who have decided to save on the manufacture of the project truss system, on the Internet there are free services for approximate calculations. 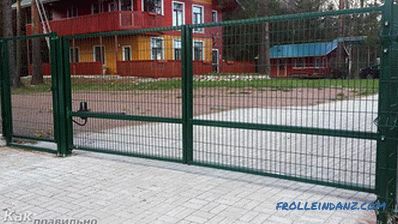 lower slider in combination with rigid fastening of the upper part. Figure 1. Scheme of gussets. 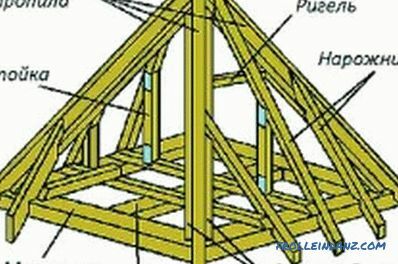 In all the above schemes, the design of the hanging trusses takes into account the minimum deflection of the rafter, the maximum bend in the skate support. Suspended rafters are the most reliable. Even if hanging rafters are not calculated, the safety margin is provided by the design itself. In all variants, one hinge ensures the rotation of the rafter legs, the second - rotation of the trusses with the possibility of slippage in the support. The industry produces special slide assemblies that facilitate mounting at height. For the calculation using the ideal scheme - the same snow load, wind load falls on the roof (Fig. 1). slanty rafters are made on the roof. there are no obstacles when walking around the attic. Before calculating the rafters, it is necessary to determine the presence of a ridge girder in the system. This element is achieved by the absence of horizontal displacement of the upper conjugation of the roof slopes. 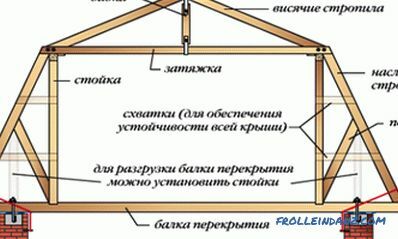 Therefore, if the racks for the run interfere with operation (a variant of the attic room), then the rafters need to be calculated for static stability. Calculations for the hip roof, gable structures with gables are the simplest. The stability in these schemes is provided constructively; during the installation of contractions, the emergency response strength margin ensures the maximum operational period. Figure 2. Simplest calculation rafters with a cut-in mauerlat, vertical trimming in the ridge. 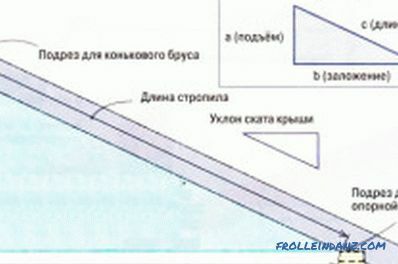 the cross section of the beam is calculated - instead used board or log. In practice, the calculation of the rafters is made according to the tables of SNiP for structural, roofing materials, loads by regions of the country. 15 kg (board) + 10 kg (basalt wool) + 5 kg (waterproofing) + 3 kg (ondulin) = 33 kg x 1.1 = 34.1 km 2. Experts recommend for light roofing materials to take a load with a margin of 50 kg per unit area. Since the own weight of the timber at this stage is still unknown, the section is selected later. 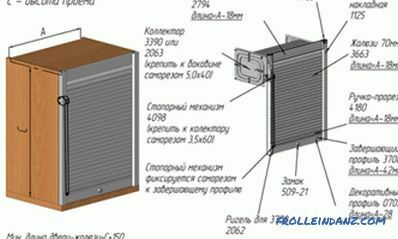 Taking into account the correction factor, the load will be 55 kg, and this is used in further calculations. 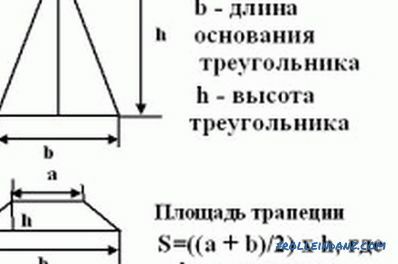 Formulas for calculating the cubic capacity of a beam on the roof system of the house. N 1 = S * k, where k is the coefficient of slope dependence, S is the mass of snow per square plot in the region of operation. Both values ​​are present in the SNiP tables. For example, for a gradient of 25-60˚, the coefficient is 0.7; 10-25˚ angles is 1. 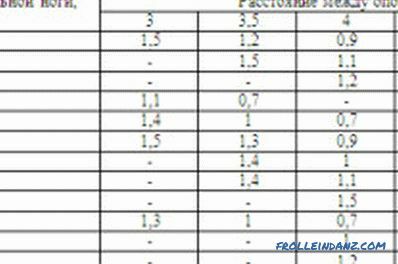 For the Moscow region, the snow cover weight is 180 kg. Therefore, for 30-degree slopes, the load will be 180 * 0.7 = 126 kg. N 2 = W * k, where k is the coefficient depending on the height of the cottage, region of operation, W is the wind norm of the terrain. height 10.1–20 m - 0.85 or 1.25 units. 23 * 0.75 = 17.25 kg . The length of truss legs is determined depending on the slope of the slopes, the location of the ridge. It is calculated by the Pythagorean theorem, in which is the hypotenuse of the triangle. After determining this value from the table, the recommended lumber cross-section is taken, which will withstand all loads with allowable deflection (usually 1/200 of the length). It remains to post s roof trusses so that they withstand all loads that normally distributed them, passed on through the load-bearing walls mauerlat. That is, the rafter step is calculated, which is then adjusted according to the value obtained. To do this, use the table again, which indicates the recommended distance between trusses (Fig. 3). Figure 3. 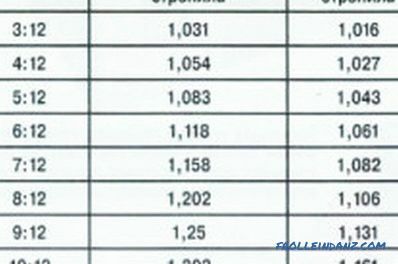 Table of rafters distances. The length of the ridge is divided by the step of the rafter legs, a unit is added, the number of roof trusses is obtained. The value is rounded up, and the exact distance between the centers is calculated. When mounting, first install side triangles, then intermediate ones. Near chimneys, wooden structures are displaced by 30 cm, in accordance with fire safety requirements. 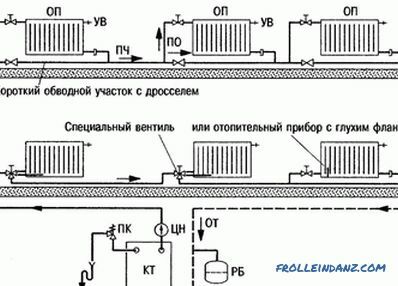 During the operation of the roof, periodic walking on it is assumed. This condition is especially relevant for slopes within 45 °, since it is necessary to throw off snow from them. Therefore, the weight of a person (100-150 kg) is added to the existing loads, providing an additional strength margin. Gantry roof rafters are more often calculated for wooden structures. 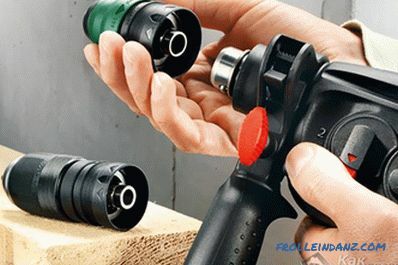 Therefore, the quality of lumber significantly affects the life of the power frame. The best option is a timber or elements assembled from boards. 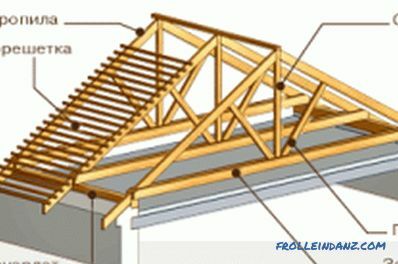 Wood of natural moisture gives greater shrinkage, which must be taken into account when rigid fixation of the rafters. Sliding fasteners provide sufficient mobility of individual elements, but can only be used in certain schemes. Figure 4. Calculation of rafters on the hipped roof. By installing the roof from the board, the chamber drying beam, the developer reduces shrinkage and increases the life of the structure. Processing fire retardants, antiseptics is mandatory, in the operated attic rooms, you must use a vapor barrier membrane, mounted under the cladding walls. Calculation of rafters on a hip roof does not differ from the standard, used for hip, gable configuration (Fig. 4). 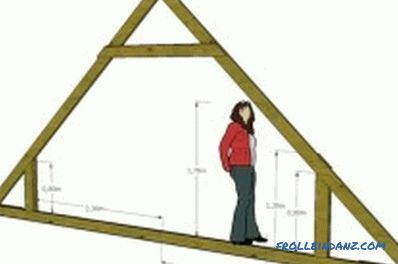 The same methods are used for the calculation of a roof using rafted rafters as for hanging ones.The differences are in the way of fixing the legs to the mauerlat, in the skate. In this case, you must have two supports, the material is bending, the design completely transfers the load to the main walls. Calculations for crushing of the material can be added to the roof calculations, if necessary, while supporting the upper ends of the legs through the ridge girder. In the case of naps, the rafters compensate for spacer loads of each other. The contractions in these schemes work in compression, these details relieve the excessive tension that squeezes the walls around the perimeter. 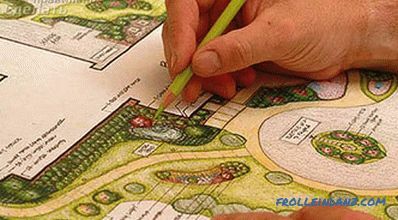 The home wizard will not be able to calculate the rafters on the roof in professional programs, since working in graphic editors requires special training and practice. Online resources will help to avoid serious mistakes, just pick up the cross-section of the timber from which the roof truss is assembled, step, length. Timber is traditionally chosen with a margin, factory-made fasteners greatly facilitate self-construction.